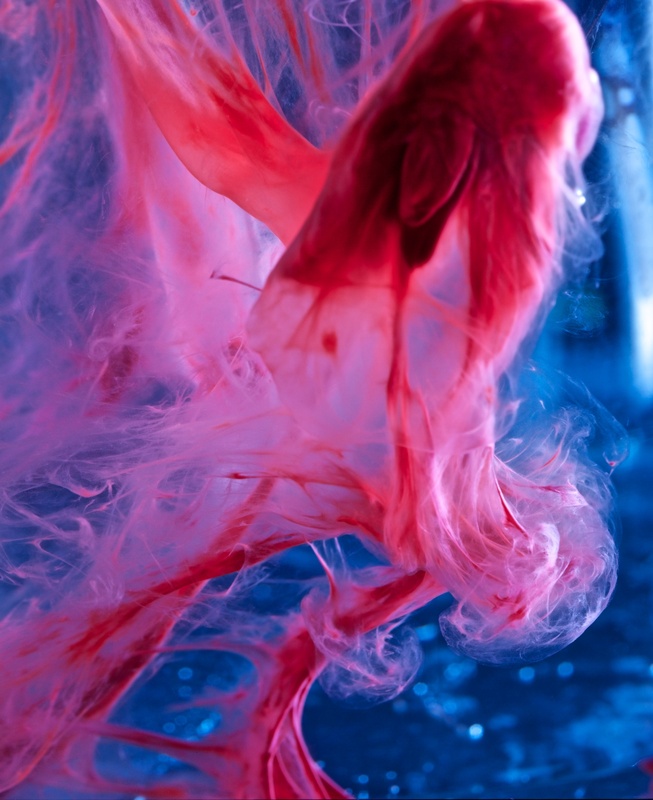 Jen Lewis began Beauty in Blood in 2012, a project dedicated to breaking down the taboo surrounding menstruation. We all have experience this taboo topic in some form or another, whether it’s being on the bleeding side or to grossed out side. Both of these positions are difficult to be in when menstruation is considered gross and unacceptable. Jen has created a series of photos that capture the real and ultimately beautiful moments of menstruating and ultimately, of being a woman. I had a chat with Jen about her work as a Menstrual Designer. Interestingly, my start as an artist completely resulted from switching to a menstrual cup from tampons and pads. My background is actually in the history of art rather than art making, but after I started emptying my cup I began thinking about Jackson Pollack and how he worked over canvas rather than at an easel. It was the act of pouring that turned my thinking to art making. At that time I was working at the University of Michigan in the Division of Infectious Diseases on their biomedical research campus (as an administrative assistant not a scientist). Unlike a typical doctor’s office where the walls are lined with cheap reproductions of still-lifes and landscapes, the research buildings are covered with anatomical and biological images. Skeletons, blood cells, tumors, animal models, disease progression, neurological pathways, that sort of thing. What is extraordinarily engaging about these images is how magnified parts of the body are. It’s like looking under a microscope or magnifying glass. I wanted to do that with menstrual blood. Get real close and look at something in a whole new way. I’ve always loved biological science and been interested in the body so Beauty in Blood seems like a natural marriage of my love of both fine art and biological science. The University of Michigan is also home to the Bioartography Program, which undoubtedly influenced me as well. They produce incredible images captured during the research process. Can you tell us about the Beauty in Blood project? Beauty in Blood is actually a collaboration with my husband, Rob. I call myself a Menstrual Designer because of how we work: I work the blood and he works the camera. When we first started, all of the art was made in “real time” – meaning while I was actively menstruating. Those evenings after work, I would remove my cup, leave the bathroom and Rob would set up the lights and camera. I would pour the blood into an empty toilet bowl to emphasise the abstract elements I saw at play: the colour contrast of bright red against stark white porcelain, the organic way the blood moved in the water, how different the blood was from day-to-day. Every pour looked different. We worked this way for about a year. During this time it was a very basic process with essentially just the camera, cup and toilet. After doing some research, Rob discovered a technique for photographing water so we tested it out and loved the results. From that point forward our process evolved out of the bathroom entirely. Now we use a small aquarium and a mixture of fresh and salt water. This mixture creates two different densities, which makes for more interesting blood movement. If you’re interested in seeing how Rob prepares the tank, here’s a video. I also work with more tools than just the cup now. I like to experiment with different blood delivery systems, i.e. pipette (awesome), turkey baster (terrible), chopsticks (excellent), travel shampoo bottle (also excellent). As I mentioned above, the catalyst for the creation of Beauty in Blood was actually when I switched from tampons and pads to a menstrual cup at the recommendation of my physician. The cup is a much more “hands-on” approach to menstruation management so my relationship with my body began changing immediately following the first use. One day when I had some blood on my fingers after emptying my cup, I started to wonder about why society framed up menstruation as something disgusting. Blood, gore and gratuitous violence are everywhere in pop culture – news, sports, movies/tv, video games, music, etc. – but menstrual blood had been completely scrubbed from the visual landscape, save a few iconic and negative images such as the movie Carrie. This is shifting now, but when I started working on Beauty in Blood in 2012 menstruation wasn’t getting the same level of press it is now. It was this awakening to the stigma of gendered blood coupled with my exposure to bioart/sciart at the University of Michigan that inspired me to create Beauty in Blood. Given female menstruation has typically been a notoriously taboo topic in Western culture, what has the reception of your work been like? In my experience (in the real world not the comments section of blogs), I’ve encountered very few people who were unwilling to engage with the subject matter or completely disinterested in Beauty in Blood as a whole. Often times, people will crinkle their nose a bit or look at me quizzically when I say: “It’s macrophotography of menstrual blood.” But after the initial surprise of “menstruation” passes, the conversation typically evolves into a 20-30 minute in-depth discussion about the various aspects of menstrual health and reproductive justice that are largely ignored by society. It’s rare to think about all the ways menstruation touches the lives of those around us, from homeless menstruators to Nepal earthquake victims to schoolgirls in South America to workingwomen in Bangladesh to the carbon footprint of disposable pads and tampons on the planet. Once you start connecting these dots out-loud, it’s hard to stop. I think part of what makes menstrual taboo so strong is the silence and secrecy surrounding it. By disrupting that silence with a bold visual statement like Beauty in Blood, I think I can spur about a change. We’ve seen evidence of that with Rupi Kaur’s artwork and the censorship she faced on Instagram. Since the Huffington Post article ran this spring, I’ve been contacted by about dozen individuals letting me know how Beauty in Blood changed the way they see menstruation. Some menstruators have told me that it makes them feel less embarrassed about their period and is helping them feel more positive about it. The fact that people feel compelled to reach out and tell me how grateful they are that I’m doing this tells me change is possible. People all over the world are now talking about menstruation because of these photos. Within themselves they are challenging these deep-rooted taboos. Now the comments sections online are a different story. I don’t spend much time reading them, but just skimming through I see a lot of knee-jerk reactions and negativity from both men and women. It’s sad how much hate women have for their own bodies and how quick they are to defend the status quo. Many commenters will say my work is disgusting and I understand why someone would find making art with a bodily fluid disgusting, but I would challenge those people to think deeper about why they think this way. The more inflexible someone is on this point is evidence of how deep the taboo resides in their own mind. A typical response from someone who thinks this way is “well why not just make art with feces or sperm.” I say, “why not?” What message could you convey? Knowing what I know about sanitation and hygiene, a work of art deploying feces could speak to bigger global and humanitarian issues surrounding water rights and sanitation. A work of art using sperm could have any number of social meanings, from a commentary on infertility to the ease with which men can obtain Viagra (in comparison to how difficult it is for women to access birth control or abortion). Furthermore, men have been working with these materials for years. Often times when people make this argument, it’s clear they don’t have a grasp on the canon of art history. 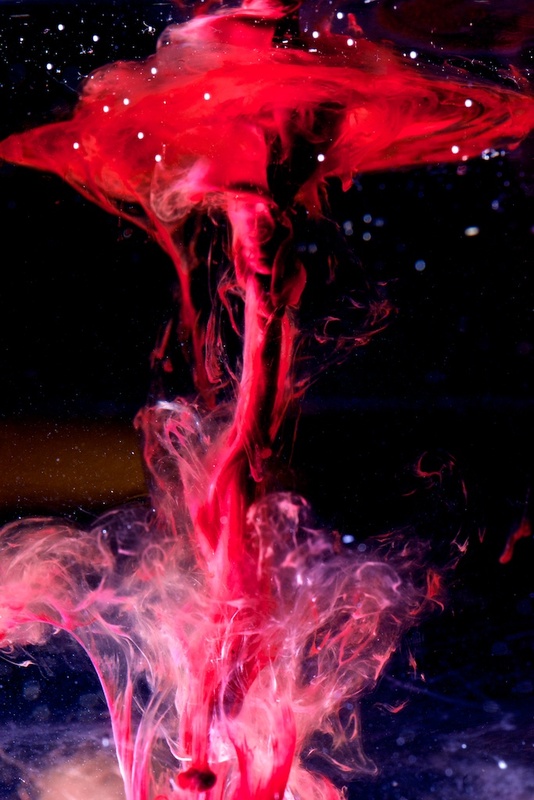 I’m not the first woman to work with menstrual fluid and women aren’t the only artists using abject materials. Two wildly popular male artists that come to mind are Chris Ofili (whose work using elephant dung recently auctioned for $2M, if I recall correctly) and Andrea Sereno (of Piss Christ notoriety). I would also draw attention to Vangardist Magazine. They recently published an issue where the cover was printed with a special ink using the blood of HIV+ patients. Just because someone is personally disgusted or repulsed by a technique doesn’t mean the art has no value or is lacking is social relevance. What has been the biggest challenge you have experienced so far? The biggest challenge is finding venues to show my art. Typically I’m limited to “feminist” specific art shows. I seek out opportunities to show Beauty in Blood within the context of social justice, reproductive justice and bioart but it’s difficult to find gallerists, curators and exhibit planners who respond to the visual element of my work as well as the social message. For some people, it’s very controversial and a risk they simply aren’t willing to take. Financing is always a big challenge as well. It’s quite difficult to find matrons, patrons or sponsors who are bold enough to fund my work. Of course, I’m not alone here. Many women and minority artists have this difficulty. Are there any artists who influence your practice? Obvious feminist art influences include Judy Chicago, Carolee Schneemann and Ana Mendieta; however, less obviously is Bernice Abbott. In 2012, the Art Gallery of Ontario showed “Bernice Abbott: Photographs,” which included a section highlighting her partnership with the physics department at M.I.T. (I think that’s the right dept.). Something about that partnership between art, science and academics sparked me to pursue my idea for macrophotography of menstrual blood. I feel equally influenced by feminism and bio science. Recently I discovered science photographer and research scientist Felice Frankel who works at M.I.T. and enrolled in her course about making science and engineering photographs. She’s blowing my mind and inspiring me currently. Her commitment to discovery and play with science art is simply incredible. What are your plans for the future of your art? In the future, I’d like to collaborate with other menstruators and take photographs of their menstrual fluid. I’m specifically interested in looking at menstrual fluid from people who have menstrual disorders like endometriosis. There is too little knowledge about what healthy and unhealthy menstruation looks like and I’d like to play a role in changing that through visual art. 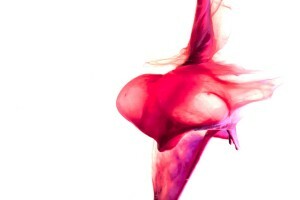 I’m also exploring the idea of photographing the other taboo vaginal fluid – cervical mucous. Like menstrual fluid, cervical mucous can tell us a lot about our bodies, but we rarely look at it or talk about it. I’d love to inspire more awareness for that and hopefully encourage some women to chart their cycles (ala FAM – fertility awareness method) through mucous. I’m an active member of the Society for Menstrual Cycle Researchers and these ideas were sparked by our recent meeting in Boston, MA earlier this month. My art gives me a voice and outlet for social activism. It gives me an opportunity to raise awareness for a subject most people would rather snicker about or ignore. It’s about using a personal experience and insight to improve the quality of life of other menstruators. What do you hope others experience/feel/learn when they view your artwork? I have two main goals with Beauty in Blood: change the way people literally see menstrual blood and raise awareness to the various human rights issues related to the menstruating body. These magnified images are an invitation for curiosity and engagement, an opening to a new dialogue that disrupts all the negativity and silence usually surrounding menstruation. I hope Beauty in Blood communicates that menstruation is nothing to be ashamed of or fear. Menstruation doesn’t need to be a mystery if we just confront it head on. I’m all about using art for personal and social transformation. Beyond communicating a singular message, my hope to stimulate these conversations and get people speaking openly about all the issues related to menstruation. For instance, did you know that not all women menstruate and not all menstruators are women? As a matter of fact there is something else I’d like to add. Once I began creating Beauty in Blood, I discovered dozens of artists around the world who were also working to stimulate a similar conversation. Because of that, I expanded my role from Menstrual Designer to that of Curator/Exhibit Planner and created a pop-up art show exclusively examining the menstrual cycle and reproductive justice called Widening the Cycle. It was an international exhibit installed at the Menstrual Health and Reproductive Justice Conference held at the Suffolk University Law School earlier this month in Boston on June 4 – 6, 2015. The exhibit had over 200 visitors during the three days and 35 artists from 10 countries had the opportunity to show their work. To my point earlier about difficulty finding venues, many of these artists had never been able to display their menstrual works before Widening the Cycle. Additionally, no academic departments, arts organisations or menstruation-related business would partner with me to bring this show to life; consequently, this venture was entirely funded by myself and a handful of private donors through a modest crowd-funding campaign. If any Lip Mag readers would be interested in showing Widening the Cycle, I would welcome future collaborations to display the collection because it is nothing short of incredible. This entry was posted in Arts and tagged art, feminism, interview, menstruation. Bookmark the permalink.